This year A2A celebrates its first decade. An important event. Furthermore, it is remarkable that its fascinating path, originating from a company merger that made public service history in Italy, has been narrated from the outset, also through the sustainability report. Our thinking and actions have always moved in a three-dimensional space: environment, economy and society. This year’s Integrated Report also represents the Consolidated Financial Statement of the Group for the first time, pursuant to Italian Legislative Decree 254/16. We have confirmed the methodological choice to refer to the Integrated Reporting Framework, as well as the consolidated international guidelines of the Global Reporting Initiative (GRI). We want the document to remain a privileged opportunity for dialogue, challenging ourselves and looking to the future, starting from today's clear vision. By materiality we mean the relevance of a theme for an organisation and its stakeholders. Listening to the needs of the community and responding to their needs and expectations is the basis for realising the concept of sustainability. The aim is to generate and distribute value in a harmonious and lasting way, reconciling the interests of the Group and its stakeholders. 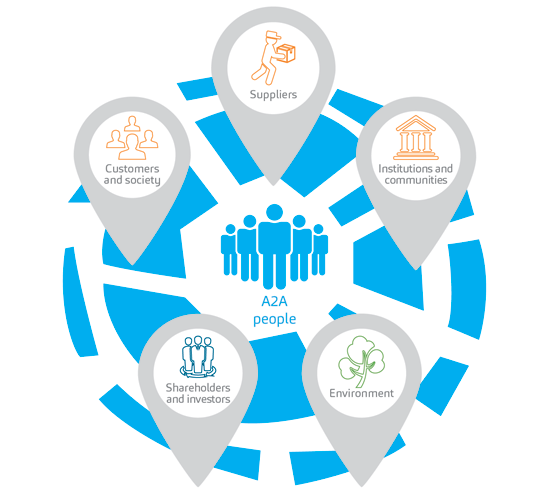 A2A has identified its main stakeholder categories, for which it is interesting to note that the main stakeholders often assume a dual role, for example: the Municipalities in which the Group operates also act as shareholders; the institutions it faces are also customers; citizens (and therefore communities), in turn, represent the greatest service users; within the category of customers are also employees and suppliers. 9evidence from the forumAscoltos carried out in 2017; the analysis of the engagement initiative database carried out by the Group. The final analysis allowed the definition of 20 themes that embrace the six Capitals and the Group's Governance system. In 2017, the forumAscolto programme, launched in 2015, continued with the aim of strengthening the Group’s link with the communities where it operates. The forumAscoltos involve stakeholders in generating ideas to be implemented in the territory, and thanks to the ideas that emerged from these forums held in 2015 and 2016, 11 projects have been completed, including the Energy Bank, which promoted a Tender in 2017 to allocate 2 million euro to 15 selected initiatives, aimed at supporting economic and social vulnerability situations throughout Lombardy in collaboration with Fondazione Cariplo. In 2017, thanks to the forumAscoltos held in 2016 in Valtellina-Valchiavenna and in Bergamo, 6 projects were carried out. Transparent communication: a kiosk inaugurated in October to provide information on the operation of the Via Goltara incinerator (heat, energy produced and emissions into the atmosphere). Milan: the forumAscolto took place on 30 January 2017, at the Spazio Base venue in Via Tortona, where 39 external stakeholders participated, representing the interests of the metropolitan city. From the discussion on the four tables, on dominant topics for the city, 4 ideas were chosen (Smart mobility, public lighting, urban decor and food waste reduction) at the planning stage. Varese: as part of the communication campaign "Varese manca poco" (Varese little to go) - aimed at achieving 65% separated waste collection - a path was developed for listening and involving stakeholders, aimed in particular at the types of users considered essential for achieving the objective: Condominium administrators, residents and commercial activities in the city centre, foreign associations, schools. Two meetings were held for each type of user, during which actions for improvement were identified and shared (specific vademecum on separate collection, updating the PuliAMO app, information campaign in schools). Udine and Gorizia: the forumAscolto took place on 18 December 2017, at the Museum of Natural Sciences in Udine, where 31 external stakeholders participated, representing the interests of both districts. From the round-table discussions, topics emerged on which to focus "CreiAMO FVG” (which will be created in 2018), the "call for ideas" - directed to residents of both provinces - aims to promote entrepreneurial projects to enhance the artistic and cultural heritage of the region.